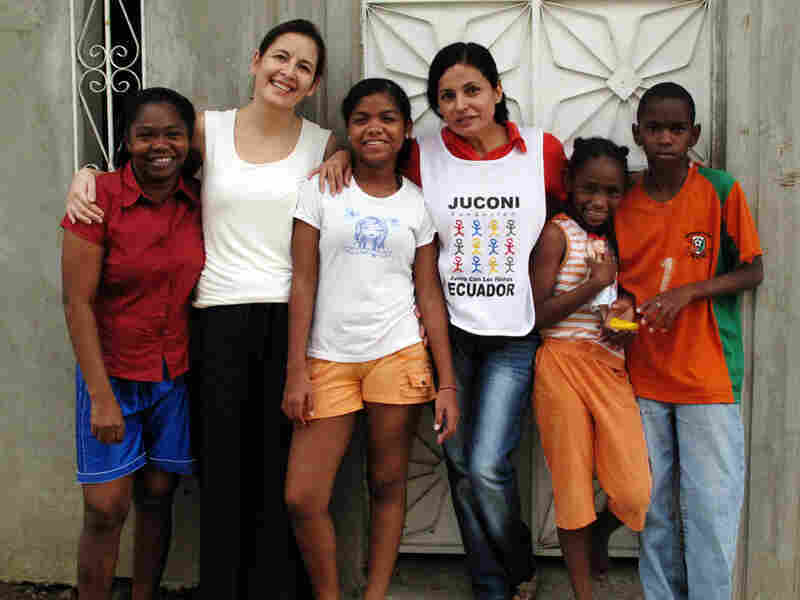 Ecuador's Hurting Families Find Hope With JUCONI The JUCONI Foundation, an organization that aims to help struggling families with everything from nutrition to emotional health, works long-term with families in Guayaquil, Ecuador. Sylvia Reyes (second from left), leader of Juconi in Guayaquil, with the Angulo family. She and Martha Espinoza (fourth from left) have worked with the family for more than six years, helping with everything from nutrition to emotional health. Tourists pass through Guayaquil, Ecuador, on their way to the Galapagos. What they don't see are thousands of street children, who have fled home to escape abuse or just to earn enough money to survive. Social service organizations there say once kids have lived on their own for too long, it can be impossible to reunite them with their families. But for one group known as JUCONI, family reunification is essential. In Guayaquil's slums, there are few street signs and fewer addresses. So it's easy to understand why, once again, Sylvia Reyes is lost. She drives back and forth over the same muddy streets, peering through the rain on her windshield. Reyes is the founder of an ambitious effort to help street children and their families: It's called JUCONI, a Spanish acronym for "Junto con los Ninos," or "Together with the Children." She and her colleague Martha Espinoza are meeting with a family that was once so troubled, Reyes wondered whether they could be helped. In fact, Reyes admits they were "a terrible family when we started — a very, very violent family." Finally, Reyes finds the home of Angela Angulo and her children. In the slum known as Guasmo, their home is one of the nicer ones. It is sparsely furnished but spacious and neat. This once-terrible family looks rather peaceful. Angulo smiles warmly as she introduces her three beautiful children: Kelly is 8 years old, Moises is 11 and Michelle is 13. The oldest, 17-year-old Jorge Luis, is not around. Music from a neighboring house shakes the walls as Angulo talks about how she met JUCONI: It began six years ago, when the family was in dire straits. Jorge Luis Angulo was just 11 years old when the Juconi Foundation found him on the streets of Guayaquil, Ecuador. 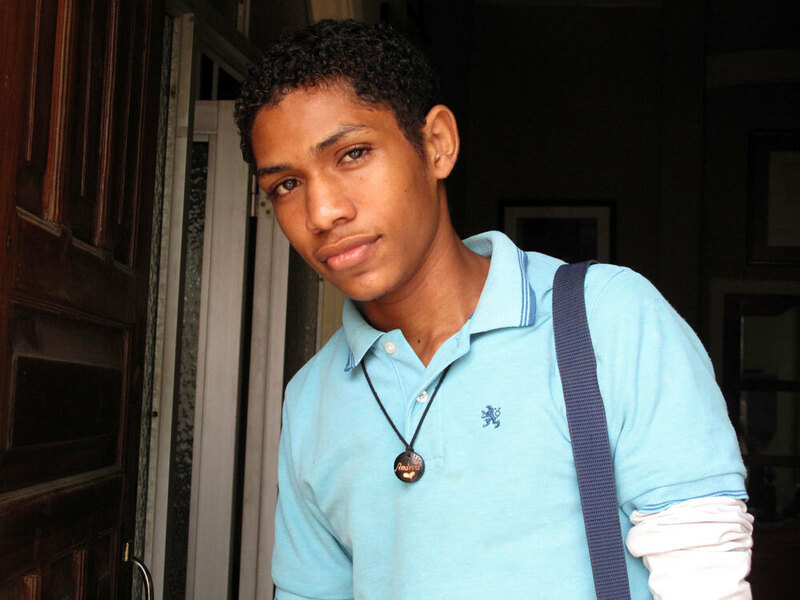 Now, at 17, he hopes to attend a university, but his relationship with his mother remains deeply troubled. "I had no hope," she says. "We were very poor. I was a child in the body of a woman without self-esteem. My kids were not in school. My husband didn't have a job." Her oldest, Jorge Luis, was just 11 at the time. To help earn money, he would sneak out of the house to sell sodas on the street. He'd proudly bring home groceries, trying to replace his father as the breadwinner. But instead of praising him, Angulo would beat Jorge Luis. She could not love him because he was the product of a horrible trauma. "When I was 18, I was gang-raped," Angulo says. Her body begins to shake and tears start to flow. "For a long time I was terrified of life. I was terrified of my own past. And all of that made me emotionally weak. I couldn't live with myself." The memory is still incredibly painful, but Angulo says working with JUCONI has made her stronger. One of the tools JUCONI uses is game-playing. Espinoza, the family's main therapist, pours out a sack of plastic animals. Each person picks one. Angulo is a horse, the children pick a lion for the father, who is not here. It's a chance for the younger kids to get engaged and speak about what kind of family they would like to be. Over six years, JUCONI has seen a lot of progress. The father now has a job, and the children are in school. The violence is gone. But mother and son can barely stand one another. Jorge Luis tells us his mother used to beat him terribly. He says he is not ready to forgive her, at least not yet. JUCONI's methods are designed to reach families that other programs cannot help. Reyes says more money is only part of the problem, pointing out that some poor families in Ecuador can take care of themselves. "So there might be a health center there, and they use that health center," she says, "whereas with our families, they can be next-door to a health center and they won't go there." JUCONI never gives up on a family. That's one reason why this group can only take on a limited number of cases: The process takes a lot of time. Grace Mora and her family have successfully completed JUCONI's program. When JUCONI first met them, alcohol was ruining their lives, and the children were living with relatives. One son was working on the streets. Today, they still struggle financially, but now Mora beams about her family and about their future. JUCONI helped persuade Mora's husband to give up drinking. The eldest son was a street kid when JUCONI found him. Now he is at the university, studying civil engineering. His first task when he graduates, he says, will be to tear down his family's cracked and broken house and build a new one. JUCONI is housed is a modest building in downtown Guayaquil. Volunteers and trained therapists come and go wearing colorful aprons marked "JUCONI." They provide a small measure of protection against the gangs who run these neighborhoods. Reyes says when she started here 10 years ago, she just wanted to get as many kids off the streets as possible. Now, she is focused on developing a method that will work for families anywhere who are most in need. "That's what we're trying to design," she says. "It's something which means it doesn't matter how impossible your life situation is, you can be helped." Reyes has training in psychology and relies heavily on outside experts in family development. Many come from the U.S. and Europe at their own expense to help her improve her work. She tracks the outcomes of her families with files that document progress toward pre-established goals, like whether there is still abuse in the family, and if there is still emotional mistreatment of the kids. Reyes has an unusual mix of skills and attributes that guide her through her work with vulnerable families. She grew up bicultural, with a Mexican father and an English mother. Her husband is the Ecuadoran consul to the U.K. — for the past two years the couple and their two children have lived in London, and she runs JUCONI long-distance and with frequent visits. The British Embassy and the European Commission are major donors to JUCONI. 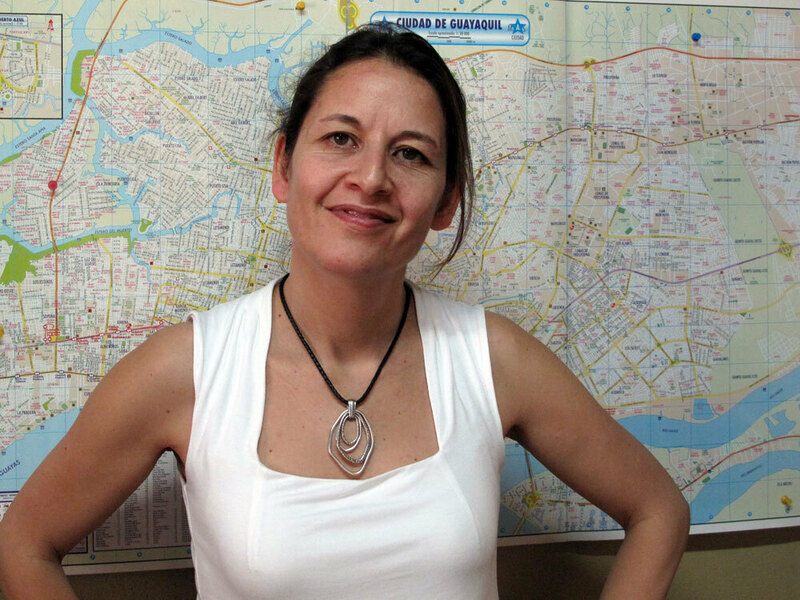 As much as she still loves this program, Reyes is trying to pull out of day-to-day operations of the Guayaquil project and focus on reproducing her success in other countries. She says Turkey is interested. She says the surprising thing is that these families actually let an outsider share their darkest secrets. Reyes hopes to reproduce her success in other countries. "We begin by giving them a level of attention and focus on them they've never received from anybody before," she says, "so actually it's a really easy sell." But Reyes says her approach is not always an easy sell to donors. They want to see clear, short-term results. And social scientists in the U.S. say reuniting troubled, abusive families can be risky and time-consuming. But they also say the alternative, foster care, can be even more harmful to children. At night, Reyes and JUCONI workers go on the prowl looking for kids. This is another signature of this program's approach. Sure enough, they find Susana, an 8-year-old, dressed in fashionably thin jeans. She is selling flowers to passersby. Suzanna tells us she and her brother often work past midnight in the clubs and restaurant here. Suzanna and her brother know they should be working, but when the JUCONI staff pull out some games and puzzles, the kids are hungry for play. They only stop when their mother arrives and tells them to get back to work. On another night, JUCONI will approach the mother to see whether she will accept their help.